In this email, there are details of a few events this and next week, as well as some insightful articles. 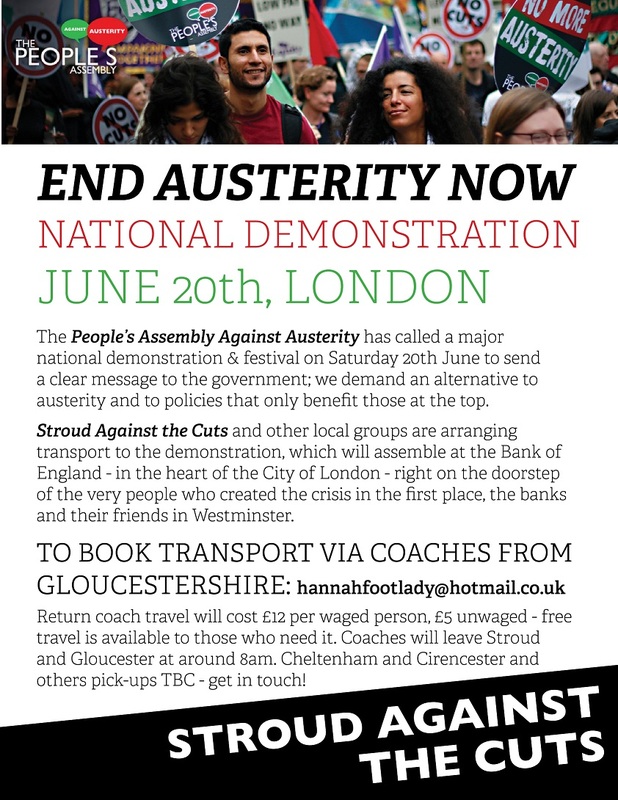 There's also a reminder to let us know if you'd like to travel by coach from Gloucestershire to the "End Austerity Now" protest on June 20th in London. We are planning a "After the election - what now for Stroud Against the Cuts?" public meeting - provisionally on Thursday 2nd June at The Old Town Hall - please put the date in your diaries! Last week we advertised a protest in Gloucester - local Green Party member Alex Lodge has written a report on the "Anti-Austerity Gloucestershire" demonstration, including photos and links to videos of speeches. 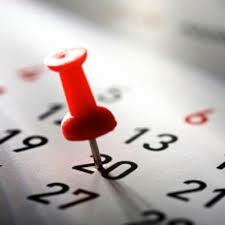 As ever - please get in touch with information or events you'd like us to share. More details about the coaches to the National "End Austerity Now" protest in London, June 20th. 1. TOMORROW Wednesday 10th June, 7.30-9.30pm, the Gloucestershire branch of the Socialist Party has one of their regular meetings at The Exchange, Brick Row, Stroud (7.30-9.30pm). The theme is the anti-austerity movement after the election. Frances James, one of the inspiring young women behind last years protest against Michael Gove's visit to Stroud, and James Collets - Socialist Party Youth member - will speak. 2. This Saturday 13th June there's another chance to get together to make placards and banners (link is to facebook event) for the June 20th "End Austerity Now" protest, at the Prince Albert pub in Rodborough, 2-6pm. Bring materials - creations can be stored at the pub ahead of the march. 3. On Sunday 14th June, 3-5pm, members of the Solidarity Federation locally are meeting in Stroud and are inviting anarchists or people interested in anarchism to "Stroud Anarchist Forum" - an informal meeting at The Exchange, Brick Row, Stroud to discuss responding to austerity and more. Email bristolsolfed@gmail.com for more information. The new Stroud Against the Cuts Facebook page has an "Gloucestershire travels to the "End Austerity Now" demonstration" event - please help us publicise it. More than 70 people have booked with us to travel from Gloucestershire to London for the People's Assembly Against Austerity "End Austerity Now" protest on Saturday June 20th. If you would a seat on a coach, please contact: Hannah (one of SATC co-ordinators) via email: hannahfootlady@hotmail.co.uk. Coaches will leave both Stroud and Gloucester at around 8am on the day, with at least one coach returning by 8pm. Pick-ups in Cheltenham and Cirencester to be confirmed based on demand. Final details will be circulated ASAP. Return coach travel will cost: £12 waged, £5 unwaged. Free travel is available to Unison members (thanks to a donation from the Gloucestershire Local Government branch) and no-one will be turned away for lack of funds. Tomorrow Wednesday 10th June will mark a crucial moment for the EU, when Members of the European Parliament (MEPs) will official adopt their vision of a trade deal currently under negotiation between the European Union and United States. 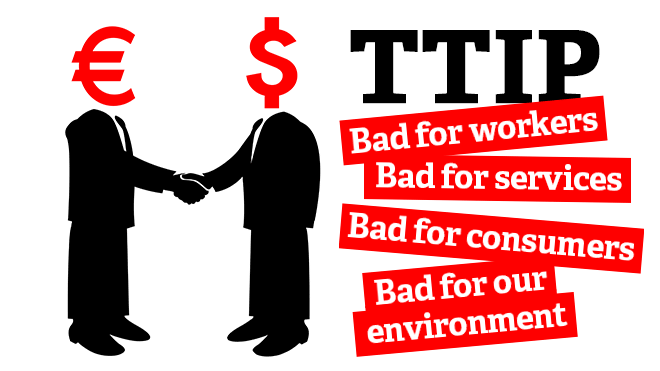 The Transatlantic Trade & Investment Partnership (TTIP) deal threatens further privatisation of public services and the undermining of social and environmental regulations. If you don't know anything about this, please read (and share) this Open Democracy article on TTIP. Tomorrow is the first big test of MEPs on the extent to which they'll fight TTIP (they are split). Most anti-TTIP campaigners are rallying round amendment 27 (see link in piece) - hopinh that if the "Investor-State Dispute Settlement" mechanism (ISDS) goes, it will be a major blow to TTIP and could derail the whole thing.you can watch a feature-length documentary on "The Trouble with TTIP" for free online. The closure of the Independent Living Fund has been called "Cameron's Cruellest Cut"
Kate Belgrave writes: "The ILF was set up over 25 years ago to pay for extra carers for disabled people with very high needs. The ILF pays the wages of the personal assistants who help disabled people wash, dress, eat, go to college, get to work and go out to social events. In a lot of cases, the total cost of people’s care packages are met partly by their local councils and partly by the ILF. A number of ILF recipients require personal assistance around the clock. 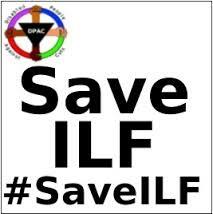 The government will close the ILF in just a few weeks’ time on 30 June. ILF recipients will rely entirely on their cash-strapped councils to pay for their care. The government insists that ILF money will be devolved to councils to cover the extra costs, but there’s considerable doubt about how long that will last and the money won’t be ringfenced by most councils. The Association of Directors of Adult Social Services is saying today that £1bn will be cut from social care services for older and disabled people in the coming year. You can see why ILF recipients are concerned about their futures." Read the full article: "Just a few weeks until the Independent Living Fund closes: Tories cut disabled people loose", and watch an excellent film about the ILF: "Mary Laver's Fight for Independence: Cameron's Cruellest Cut". In better news, "The work and pensions secretary, Iain Duncan Smith, has suffered legal embarrassment after a judge ruled that delays in the payment of disability benefits, which left two vulnerable claimants isolated, depressed and unable to afford food, were unacceptable and unlawful... Gillian Guy, the chief executive of Citizens Advice, said: “Delays to Pip assessments are unacceptably common. Over two years since [their] introduction they are still not fit for purpose." "Independent work on safer ratios of nurses to patients across the NHS, was a key recommendation of the Francis inquiry into failings at Stafford hospital. This week, the government quietly shut that work down." Timely access to well-qualified professional health workers is what good health systems are all about - it's not complicated. Read an excellent article from NHS nurse Mark Boothroyd on how this week's "Government u-turn on safe nursing levels [has been] branded a "betrayal" by Mid-Staffs campaigners". 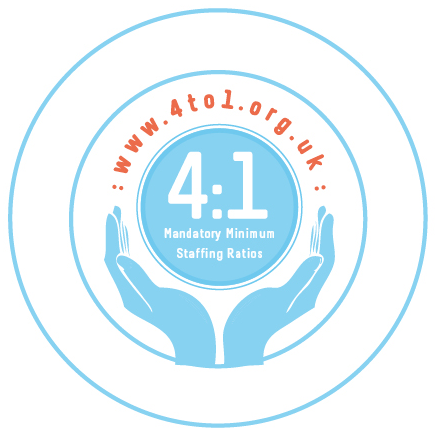 Find out more about 'mandatory minimum staffing' at the 4:1 campaign website. Cure the NHS are saying they will march to Downing Street on the 18th June over safe staffing. Meanwhile, Secretary of State for Health Jeremy Hunt has been talking of reducing the costs of agency staff in the NHS - but doesn't "Tough talk by the Health Secretary on NHS agency costs belie the fact that the problem occured on his watch - and as a result of his government's market policies"? That's what Benedict Cooper argues in "NHS agency staff - the market reaps as Hunt sows"
Steve Topple, who writes for social security advice website Consented UK has written a timely and powerful article on the treatment of alcohohism in the UK: "Alcoholism, the NHS, and political hypocrisy" - "Politicians show sympathy for the sadly premature death of Charles Kennedy - but none for the ordinary alcoholic, facing cuts to services and threats of charges for A&E use." A campaign at Warwick University has called a national demonstration against casualisation of employment in Higher Education. 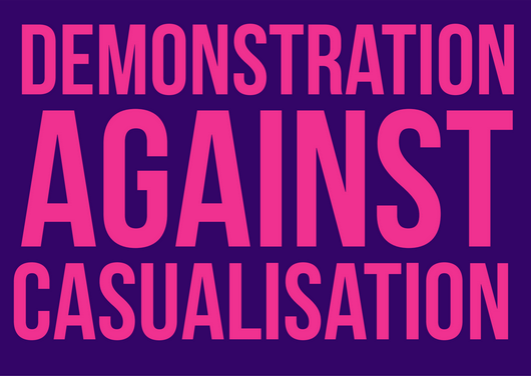 The demonstration, on Friday June 19th at the University of Warwick campus is supported by Warwick UCU, Birmingham UCU, Warwick For Free Education, National Campaign Against Fees & Cuts and Fighting Against Casualisation in Education. "Warwick University staff and students call on their colleagues across UK Higher Education to support them in resisting TeachHigher. TeachHigher is a scheme whereby hourly paid academic staff will no longer be recruited and employed by academic departments [...] We oppose TeachHigher because it will institutionalise and entrench a two-tier system of academic staffing at Warwick – further separating off hourly-paid academics from those on more secure contracts." Over the last few months NUT members and other trade union colleagues at the Prendergast Federation in Lewisham, together with students and parents, have mounted a tremendous campaign to oppose academy conversion proposals at three schools. Read about the successful anti-academies campaign. Today, Tuesday 9th June, Bicycle Couriers in London have taken a day of strike action against employers CitySprint. Delivery workers have seen the rates they are paid stagnate in cash terms for 15 years - producing a sharp pay cut as the costs of living in London rise. Watch "City Skint" an excellent video of interviews with bicycle couriers, for background. An anonymous pushbike courier said: “London is one of the most expensive cities in the world, and we haven’t seen a pay rise in twenty years. Most of us work nine or ten hour days on average. Sometimes I come out with less than minimum wage equivalent pay for that amount of time”. 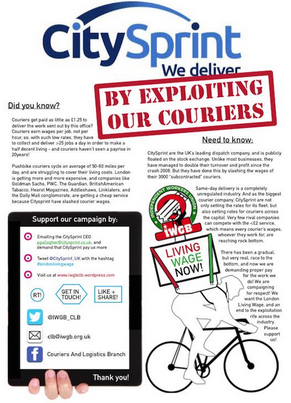 Read the full Independent Workers Union Press Release: "CitySprint Pushbike Couriers stage day-long London Living Wage protest". Last year, cinema workers at Curzon cinemas secured the London Living Wage and union recognition. You can read an interesting essay-interview with workplace activists at the Curzon Cinemas covering their living wage fight, their union recognition agreement, and changes to their terms and working conditions. "Homeless charity Shelter has identified Gloucester as one of the 'hotspots' across England where people are most at risk of having their home repossessed or being evicted. According to research by the charity more than 200,000 possession claims were issued by mortgage lenders and landlords in England in the last year. 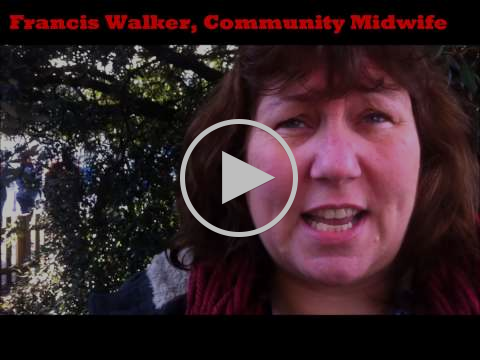 It shows that in Gloucester one home in every 109 are at risk [of eviction]." "Hackney council is using new laws to try and cleanse homeless people from its more fashionable corners. Under the rubric of public “safety”, the lived reality of London, with its poverty and inequality, is being swept under the carpet". 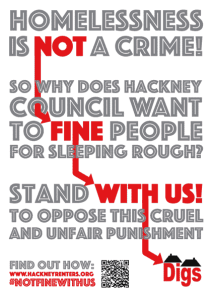 Read: "Homelessness, freedom and why we should resist the social cleansing of Hackney"
"Facing psychological coercion and manipulation has become a daily part of claiming benefits"
"Psychological explanations for unemployment – the failings of the maladjusted jobseeker – isolate, blame, and stigmatise unemployed people. They reinforce myths about “cultures of worklessness”; they obscure the realities of the UK labour market and the political choices that underpin it. The same is true of psychological prescriptions for treating unemployment." P.S. Please like our Facebook page and posts, share this mailing with your friends and family via email, facebook or twitter, and get in touch if you'd like to get more involved.